RIO DE JANEIRO, BRAZIL – This time of year watching the American NFL (National Football League) in Brazil is a little more complicated because the daylight savings time changes now put Rio three hours ahead of Eastern Standard Time (EST). That makes the 1PM kick-off on the East Coast of the U.S. starts at 4PM in Rio, and perhaps more importantly driving the night games on Sunday, Monday and Thursday into late-night affairs. 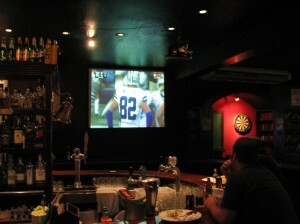 Sunday NFL at Shenanigans starts early and shows the local network games on the big screen, photo by Blake Sherman. The sport is still easier to follow in Brazil than it has ever been, with the high-speed internet connections now available, live streaming options like the the official NFL Game Pass (available outside the U.S.) make it surprisingly affordable. There are also various pirate-streaming sites one can uncover, and although lower-quality, they are free for the patient and dedicated. To make watching NFL even easier in Brazil, the major Brazilian cable networks are airing more and more games on their Sports channels, and with new audio technology it is usually possible to switch to the English-language commentary with the push of a button on the remote control. Off course the NFL will always be a distant second to local futbol (soccer) match schedule, so it’s hard to plan your day around this. The Blue Agave in Ipanema during heir Super Bowl party last year, photo internet recreation. Another main-stay for watching the NFL in Rio is Shenanigan’s Irish Pub & Sports Bar in Ipanema. The bar was opened over twelve years ago by a group of American expatriates, but in 2012 was sold to Brazilian owners who fortunately continue to make showing the NFL games a priority. Opening on Sundays in time for the early games (which start at 4PM after November 2nd this year) with a large projector screen keeps Shenanigan’s the first option for many. They have also kept a major Super Bowl party tradition alive and well (this year will be on February 1st). Another American-owned establishment in Copacabana is the Clover Irish Pub, which has invested in the ability to not only play whatever games are showing locally, but also – at the same time – stream any game direct from the United States across seven flat screen TVs. For those who want to sit outside and watch the games in the shade, then Mab’s on Copacabana Beach is a great option, also owned by an American expatriate. There are a few other locations that will show NFL games on occasion, such as the Gringo Cafe, Lord Jim’s Pub, Banana Jack’s and the Mud Bug. It is best to call ahead to make sure there are no conflicts with other sports programming, and plan to arrive early to lobby for the desired game. And what about down here in São Paulo? I use NFL Gamepass. R$35/month. I got tired of the skippy, jumpy, laggy streams from the “pirate” sites, but I’m stuck with them for NASCAR. And about Sao Paulo? Do we have options? Just NFL GamePass that I know of Diego. I found a spot at Sao Paulo, it’s a Pub. Go Eagles !!!! See ya. Thanks Diego! I’m seeing a R$40 cover consumivel. Does that mean it counts towards drinks? I’ll be there. I just hope there’s cabs at that time of night when the game ends. I know the transit system will be shut for the night. Cool ! I’ll be there wearing a Eagles T-Shirt. Yeah, no services subway that time after midnight. But it’s nearby from Avenue Paulista, so you can take a cab there easily. I don’t know what I’ll be wearing. Maybe my black Deadliest Catch t-shirt. I’ll have to look into it, thanks.